The observation of safety regulations is rarely more important than while driving. Cars and trucks weigh a tremendous amount and often travel at very high speeds. Even when a vehicle is traveling at a more moderate or slower speed, it can do serious damage. When children are involved in motor-vehicle accidents, their injuries can be severe and long-lasting, as children are more vulnerable to certain types of injuries than are most adults. Child traffic-accident-injury lawyer Jeffrey Killino has years of experience helping injured children and their families. If your child has been injured in a motor-vehicle accident, you may be entitled to compensation from those responsible. Contact attorney Killino at 877-875-2927 to learn more about your legal options. Children may suffer injuries in car accidents, school bus accidents, or pedestrian accidents. When the operator of a motor vehicle injures a child in an accident caused by speeding, reckless driving, or driving while under the influence of alcohol or drugs, the driver may be liable for damages suffered as a result of the child’s injuries, including. compensation for medical bills, pain and suffering, and lost earning potential. 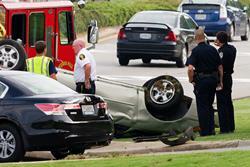 Traffic accidents that result in injuries to children are very common. According to some statistics, nearly 700 children, on average, are injured in motor vehicle accidents in the United States every day. The American Academy of Pediatrics (AAP) has reported that although vehicle-accident deaths of children under the age of 16 decreased by 45 percent between 1997 and 2009, vehicle accidents are still the leading cause of death for children over the age of 4. A child’s traffic-accident injuries may be caused by someone’s negligence or by a defect in one of the vehicles involved in the accident. According to the AAP, approximately 1 in 5 child traffic-accident deaths involves a driver who was alcohol-impaired at the time. In most cases, the alcohol-impaired driver was the driver of the car in which the child was riding. Driving while under the influence or alcohol or drugs constitutes a violation of all states’ traffic laws and will be found to constitute negligence on the part of a driver whose impairment was significant enough to cause a vehicle accident and a child’s resultant injuries. The injuries sustained by a child in a traffic accident may be caused by the negligence of the drivers of one or more of the vehicles involved. If your child was being driven by a teenager or adult who had undertaken the responsibility to care for your child and your child suffered injuries in an accident that was caused at least in part by the negligence of that driver, the driver may be held liable in an action for negligence for the injuries suffered by your child. In some cases, the negligence of a driver other than the driver of the vehicle in which your child is riding may be a cause of the injuries sustained by your child in a traffic accident. That driver’s negligence may be the only negligence that contributed to the accident or it may have combined, as a cause of your child’s injuries, with the negligence of the driver of the vehicle in which your child was riding. The plaintiff in an action for negligence against the drivers of more than one vehicle will be required to prove, by a preponderance of the evidence, the respective driver negligence and the causative connection between such driver negligence and a child’s injuries. In some states, the owners of vehicles lent by the owners to others who become involved in vehicle accidents may be found liable for injuries sustained in such accidents. This liability may attach to the owner even if the owner had no prior knowledge or reason to suspect that the driver to whom the car was lent was an incompetent or inexperienced driver. Product-liability actions may also be brought, in certain cases, to recover damages suffered by children in motor-vehicle accidents. If a defect in any of the vehicles involved in an accident in which your child was injured is determined to have been a cause of your child’s injuries, the manufacturer of the vehicle or of the vehicle’s defective part as well as anyone in the chain of the vehicle’s distribution may be found liable for your child’s injuries in a product-liability action. Such an action may be maintained in addition to an action for negligence against one or more of the drivers involved if driver negligence was also a cause of your child’s injuries. If your child has been injured in a motor vehicle accident through someone’s negligence or a defective product, contact child traffic-accident-injury lawyer Jeffrey Killino at 877-875-2927 for experienced and competent assistance with your case.